Dennis Dollens is a fervent biomimic. His well known work involves the idea of a tree-like structural system that houses glass leaf clusters designed to regulate ventilation and control light. You can follow the entire development of the project on his website, but in summary it would be safe to say the idea came from a series of branch structures acting as trusses that support paper-like membranes eventually resembling a canopy. His site also notes similar projects that have taken inspiration from nature to find solutions to other space making problems. 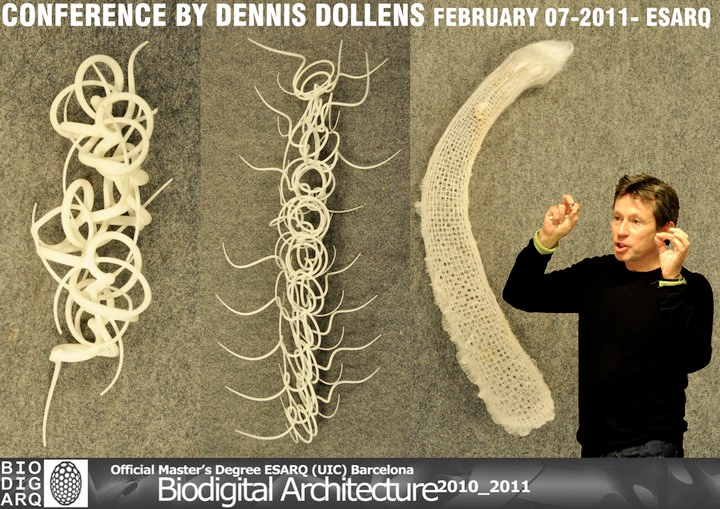 Dennis Dollens’ website is exodesic.org. This entry was posted on Wednesday, February 9th, 2011 at 3:35 pm	and is filed under Multimedia. You can follow any responses to this entry through the RSS 2.0 feed. You can leave a response, or trackback from your own site. The 3D Printer is increasingly becoming simply a tool of the people. It’s amazing what people are capable of when the right tools are in place. Awesome article! What I think is amazing is the complexity and dynamics of each model, this tied with the extremely diverse material potential of 3D printers could create some very valuable products. Food printers are in my mind!